This is definitely the black sheep of the Mission: Impossible franchise. The first one was a fun action film that introduced to the spy world really well, and on paper, this sequel had everything going for it. An A-list leading man (Tom Cruise) and a director (John Woo) known for his out there stunts and action sequences. The end product is nowhere near as much fun as it should be. The second Mission: Impossible film ends up being a generic action film, not adding much to the genre, and not letting us get to know any of the characters, particularly Cruise’s Ethan Hunt, any better than we already did. Thankfully, this would change for the follow ups. This film’s most redeeming feature is that it didn’t irreparably damage a franchise that still had so much more to offer. In the third and fourth instalment, we definitely get the payoff this franchise has promised. But first we need to sit through the average second film. We see Hunt still working for the IMF (Impossible Mission Force), and is recruited for a mission by his new minder (Anthony Hopkins) to retrieve and destroy a genetically created disease called the Chimera. Hunt is sent to Australia to stop the sale of the disease which will kill millions if it ever got into the open. He has to do it with the help of old friend Luther (Ving Rhames) and a former lover (Thandie Newton), who also happens to be the current squeeze of main baddie Sean Ambrose (Dougray Scott). As I said before, there is not much on offer here that most action films don’t already offer, especially given the talent involved. What sets the Mission: Impossible franchise apart from the rest are the outrageous stunts and edge of your seat thrills. They are both sadly lacking in this movie. The most riveting part is the sequence where we are reintroduced to Ethan Hunt while he is climbing a mountain. Outside of that, there is not much on offer here. The setting of Australia is also incredibly distracting. All of Dougray Scott’s henchmen have ridiculous Aussie accents, which make it very hard for them to appear threatening as it is potentially the world’s most friendly accent. I’m sure Dougray Scott hates this film more than anyone though. Because filming went later than scheduled, he had to pass on the role of Wolverine in the X-Men films. He was the first choice for Logan, and had to be replaced by Hugh Jackman at the last minute. We all know what happened there, but I will give you my opinion of Jackman in those X-Men films when we get to them. Mission: Impossible II, by far the weakest of this above average franchise. I am glad it is now over so we can get to the good stuff. Bring on MI:3! Mission: Impossible II opens with Ethan Hunt (Tom Cruise) free climbing in the desert. This is definitely the best part of the movie. I honestly remember nothing about the plot, nor can I place any scenes outside of the opening. Apparently a lot of it’s set in Sydney, so you’d think I’d remember something. But no, this is just a generic action flick that’s been lost in the recesses of my mind. 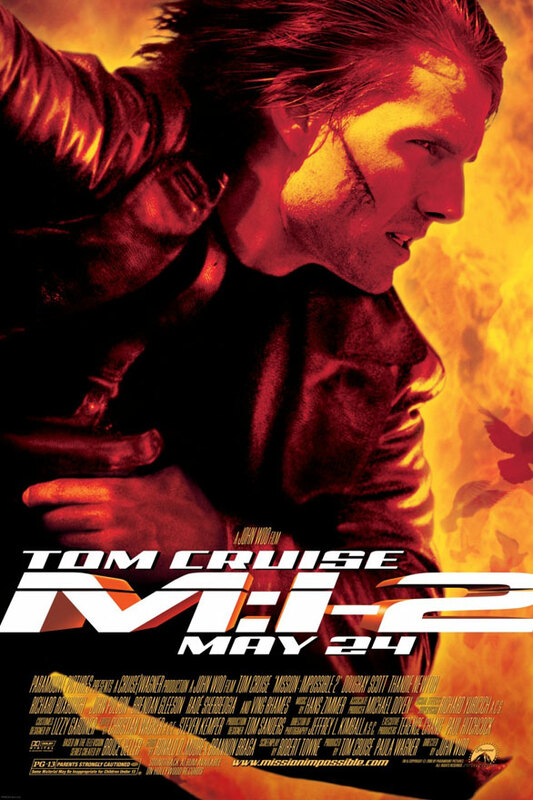 The one silver lining from watching M:I-2 is that it reminded me of the MTV Movie Awards parody where Ben Stiller plays Cruise’s stunt double, Tom Crooze. My advice, go watch it and skip this movie.